Diving the Ojamo lime mine in Finland, 138 meters of water, 4°C. Imagine sub-zero temperatures and a hole in the ice. That is your entrance to the underworld of Ojamo, the most popular diving site in Finland. The Ojamo lime mine is situated 60 kilometers west of Helsinki. It attracts thousands of visitors every year. The mine area is part of the city of Lohja, known for its industry. The mining operations began here in the 19th century. When the open pit got too deep, mining was taken into the tunnels. More technology was introduced to boost the human powered operations. Ojamo mine was a key driver of development for the area for decades. It fuelled the local economy and provided work for the locals. When Finland entered the war with Russia in 1939, the mine was turned into a prison camp. The prisoners worked in shifts and lived miserably in tents at the bottom of the open pit. There weren’t enough clothes for everyone, so the prisoners exchanged mantels between shifts. Today, since water filled the mine, it looks just like another small lake inside the forest. The shallowest tunnels start at a depth of 28 meters, from the bottom of the open pit. The mine reaches a depth of 250 meters at the bottom of the main mining shaft. The exact depth is not known, as there was some landfill done in the shaft after the mine was closed. The deepest recorded dive at the mine is 160 meters. The water level reaching ground level makes diving easy at Ojamo. Divers can park their cars next to the lake and jump into the water. In many other places, like the popular Tuna Hästberg iron mine in Sweden, gear needs to be lowered deep into the mine with winches, tens or even hundreds of meters, before reaching the water level. The huge mining halls are quite an experience. I remember vividly my first dive into one of these huge cathedrals. My hands started moving in circles, as if I was falling down from a cliff. The crystal clear water and dark depths deceive the eye of the inexperienced. When in operation, the mine was not a place for a person with bad nerves or a phobia of heights. The halls are sometimes so big that no walls can be seen when crossing them. The only guide is the white line running through the emptiness. These chains of halls can be quite confusing. In a natural cave, it’s sometimes easier to remember details. In a mine, the mechanical marks of mining all look the same. There are many kilometers of tunnel at Ojamo, although the longest continuous stretch is only 1.7 kilometers, at the 88-meter level. There’s also little variation in depth on each level; the tunnels run almost horizontally. There are plenty of shafts and mining halls that are used for travelling from one level to another. All this makes planning dives easier than in a natural cave, as the multi-level plans can be reasonably accurate compared to natural tunnels going up and down all the time. It means that there are no reverse profiles either. In Finland, there are no natural caves suitable for diving. The ground is solid granite, which is too hard for water to carve underground rivers into. Even the limestone at Ojamo is tightly squeezed inside hard rock where carbon dioxide cannot eat its way through the stone. From the mine diving point of view, granite has many benefits. The corridors and vast halls are stable even without supporting structures. There are many closed mines suitable for diving in Finland. Many of them have been closed only recently, or there is no required diving infrastructure for various political or geographical reasons. One example of these kinds of sites is the Outokumpu mine, a name known globally because of the mining company that started its operations from that very spot. Today, Outokumpu is one of the leading stainless steel and copper manufacturers in the world. For divers, the name means multiple kilometers of unexplored territory. Many of the mining sites are in remote places. This means that their number of visitors is low compared to Ojamo, even when they are otherwise quite suitable for diving. 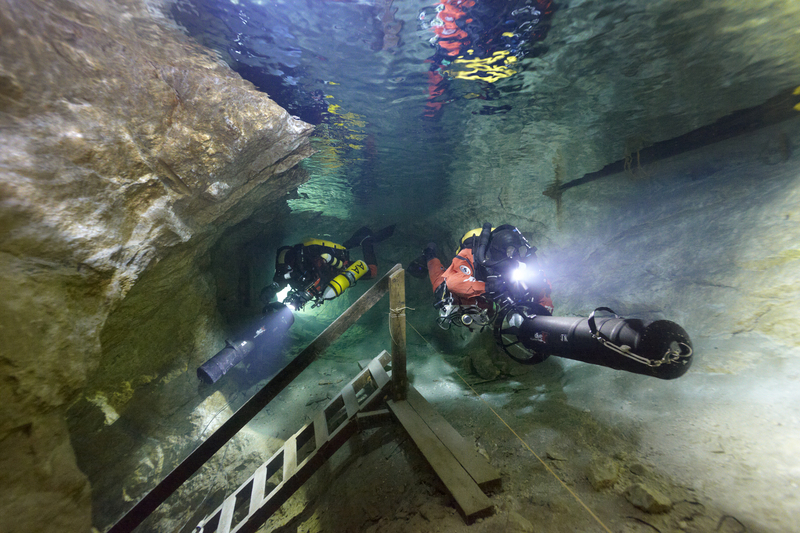 One of the popular sites, Montola, was closed for a while because of a recent fatality—one of the few ones in the short history of Finnish cave diving. The Montola accident was a typical cave diving accident, with the added local environmental characteristics. The water in the open pit was very murky, with a summer time visibility of only one meter or so (during winter the water is clearer, as there is algae in the water in the summer). The visibility probably played a part in the accident, as the team members got separated and did not recognize the shortest way out, even though the entrance was never very far away. So even in mines with almost no flow, the circumstances can be treacherous. Ojamo mine has been dived for almost 40 years. The mining came to an end in the mid-1960s. The market price for lime had declined, and there was no financial point in continuing operations. After the mine closed, it slowly started to fill with water. With many kilometers of tunnels, it took quite a number of years before the water reached ground level. Shifting Baseline Syndrome: Are you afflicted?